You know, we can light a 1 watt LED without a battery! Peltier will give “Free Electricity” for that. When we heat the Peltier with flame, hot water or a hot object, it starts to generate current. Its voltage can be around 1.5V when the heat is above 60 degree. But this 1.5V is not sufficient to light even an ordinary LED that requires 1.8V minimum. 1 watt White LED requires 3.6V. Then how? We can add a Joule Thief circuit for that. A Joule Thief circuit is a self oscillating circuit that increases the input voltage as low as 700 mV to 4-5V. So if the Peltier is connected to a Joule Thief and heated, Joule thief will amplify the voltage to light the 1 watt LED. Let us check this. 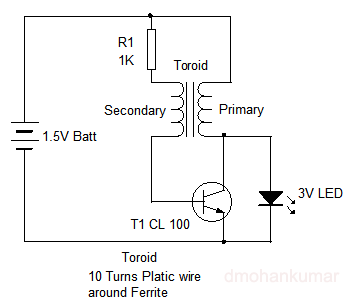 Joule thief circuit is a self oscillating voltage booster circuit that gives high volt from low volt, say 3 volt from 1.5 volt. So by exploiting this property, we can light a 3 volt LED using 1.5 volt pen cell or charge a mobile phone from 3 volt solar cell or two 3 volt pen cells. It is called as “Joule thief” because it is stealing energy or joules from the battery. Let us design the Joule thief circuit.